Today is Friday. 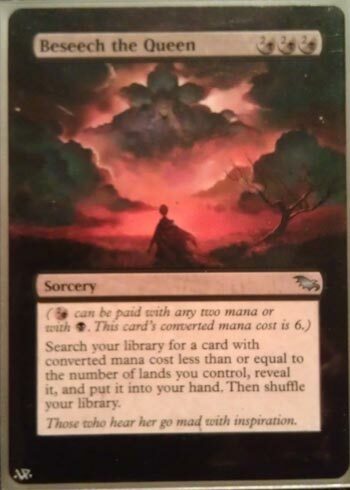 A great day to sit back and look at some great alters. I won’t be doing a set art review this week. 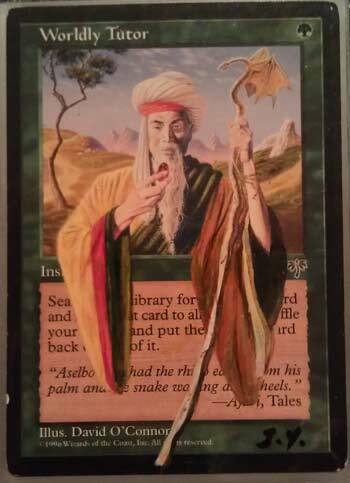 Instead I’ll be taking a look at altered cards once again. 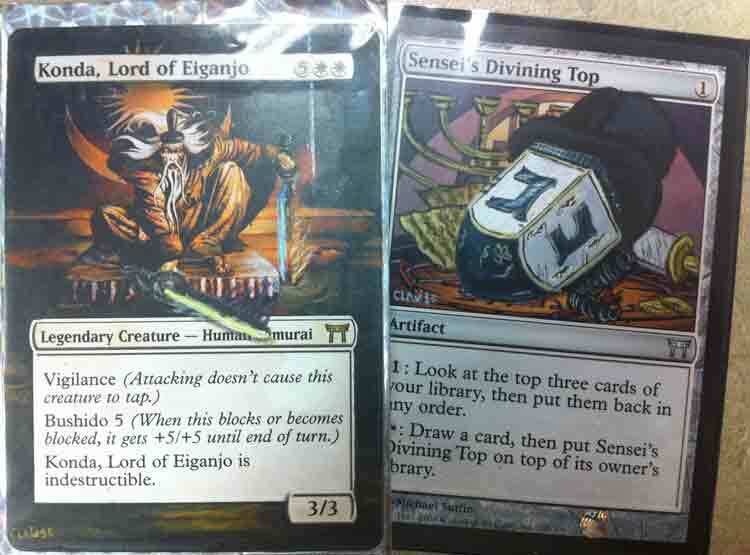 This week we have another submission of altered cards from a reader. Also I will be showing off my favorite alters from my own commander decks. To wrap up the article. I will be taking a look at a cool new hassle free way to trade. You may have heard about it on the podcast before, but if you haven’t taken a look at it yet, Pucatrade can hook you up big time. Now its on to the show. Straight from my very own decks I present my favorite alters. If I had unlimited cash and/or talent I would certainly pack my decks full of alters. Altered cards are a great way to add your own personal touch to a deck and beyond that they are usually a great conversation piece. After all, this is a social format so chatting about an altered card you just cast sure beats everyone silently staring each other down while plotting their paths to sure victory. This great alter of Wordly Tutor currently resides in my Glissa, the Traitor deck. Instead of just tutoring up a creature using a dude in a robe eating a chicken nugget, you can tutor up a creature using a dude in a robe eating a chicken nugget while partially obscuring the text box. That’s pretty much the urban dictionary definition of “pimp” right there. 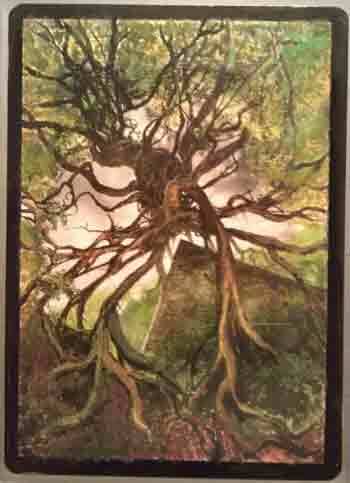 I actually won this card in Andy’s Gift’s Given charity auction a couple of years ago. Supporting a good cause and snagging a great alter, it was a win-win. Now its time to go tutor up that Blightsteel Colossus, reveal it and put it on top of my library. That way when it gets Bribery’d my opponent doesn’t have to search my entire library for it. Its the polite thing to do. 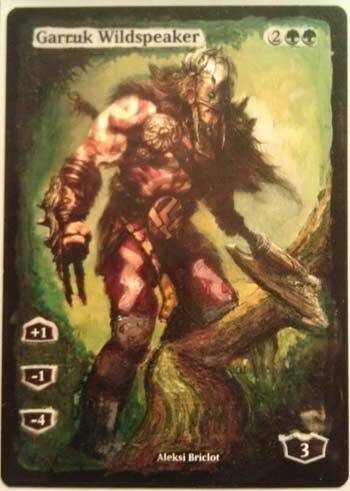 This Garruk was a surprise gift painted by my significant other for my Christmas gift. I had no idea I was getting something so awesome on Christmas day. However, she did get a bit nervous when I realized my Animar deck was missing a card sometime in mid December. I had just chalked it up to a card getting mixed into the wrong deck. The reality was much cooler. It’s a card I’m always excited to show off. I really like this Beseech the Queen alter because its subtle, but still looks very cool. 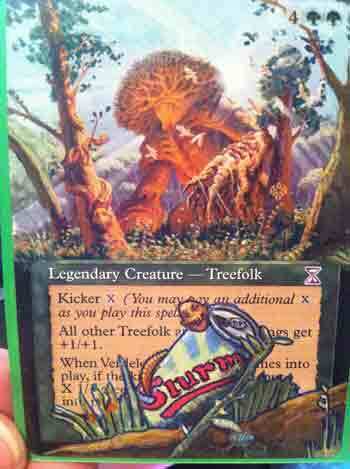 Extended art is one of the most popular forms of card alteration, and when I saw this one I just had to have it. This tutor currently resides in Glissa as well. It sort of reminds me of old bordered black cards. They were dark and had tattered parchment text boxes as opposed to the brighter grays and whites on the new black frames. No parchment here, but a definitely a darker look. How long are games of commander? Sometimes they are pretty long. 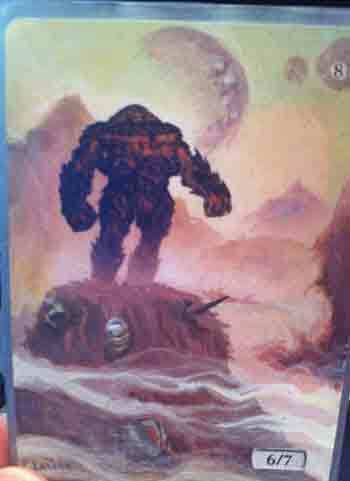 This alter is cool because it was begun and finished during a single game of commander, also by my girlfriend. It lives in my Glissa deck with all of it’s full art friends. Bosh seems like a very cool general. He is certainly on my list of commanders that I want to try to build around one day. The new Hellkite Tyrant from Gatecrash seems like he would be best buddies with our metal friend Bosh here. I just finished up a Korlash deck that very much wants this alter. Madhatter, I’ll be sending you my mailing address. 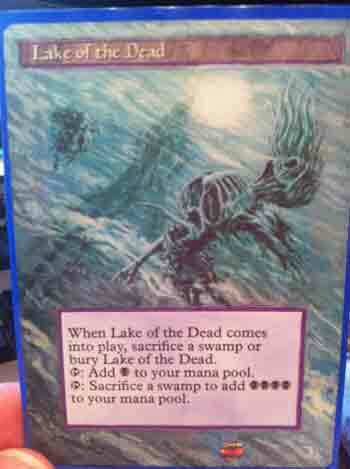 I expect this sweet, sweet Lake of the Dead to arrive in my mailbox very soon. Make it happen! 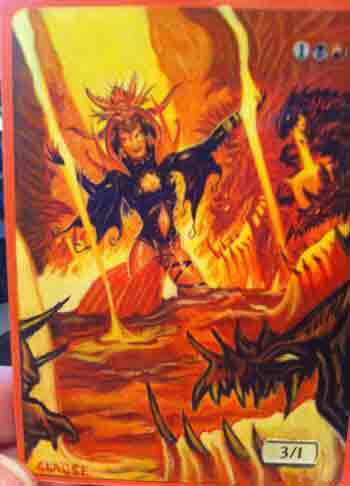 If there is one thing Lyzolda needed more of, it was magma dripping from the maw of a beast. I approve. Verdeloth is one of my favorite green creatures to play in commander. I have one in my Thromok deck. Maybe he isn’t the most efficient choice, but he has a lot of nostalgia on his side. He certainly won’t be getting cut anytime soon. This alter takes and awesome creature and throws in a solid Futurama reference. This Konda is fully equipped and ready to swing into action. No one wants to wade into battle without their dreidel themed diving top, so that’s all ready to go too.